Pinterest is full of "mini cake" ideas. Since I've recently started decorating again, I have a big list of projects I want to try. The good thing about a mini cake is that when you have absolutely zero reason to bake a cake, you feel less guilty about whipping one up. This was the case this past Friday afternoon when I made a quick 6 inch chocolate layer cake. Earlier in the week I bought some green candy melts while perusing Target's Christmas aisles, and I found a Pinterest idea that could use both of these items. Click here to see my inspiration! 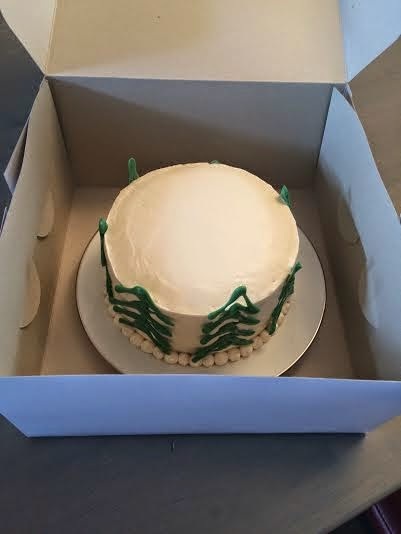 The basic idea is to frost a round cake with a basic white frosting, and press some chocolate trees into the side. 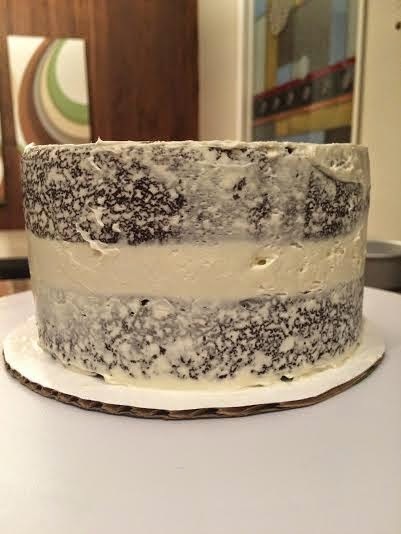 I used my favorite swiss meringue buttercream recipe from Martha Stewart, my favorite scratch chocolate cake recipe (below), and simply piped some melted Wilton Candy Melts onto some parchment paper. My favorite chocolate cake recipe is generally made in either an 8x8 or 9x9 square pan. It also works well for cupcakes (makes about 15), and in this case, a two layer 6 inch cake! This recipe is awesome because its quick, requires only a whisk and a wooden spoon, and bakes up in less than 1/2 an hour! It's moist, and the perfect density. This is adapted from a Taste of Home Recipe, found here. Mix all the dry ingredients together in a large bowl. In a measuring cup, measure water, oil, vinegar and vanilla. Add to the dry ingredients and mix thoroughly with a wooden spoon. Switch to a wire whisk and beat out the majority of the lumps. Poor the batter into a parchment lined or greased pan (in this case I poured half into each 6 inch round pan). Bake for approximately 22 minutes (for the 6 inch pans or cupcakes), and between 25 mins to 30 minutes for the square 8 or 9 inch pans. I filled the cooled chocolate cake, and used a layer of icing to crumb coat this cake (a chocolate cake crumb is pretty unforgiving, especially with this moist cake). 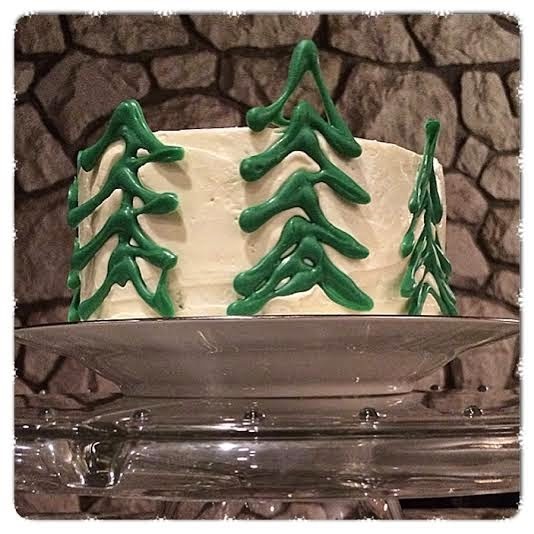 A great tutorial on properly crumb coating and icing a cake can be found here. Unfortunately I don't have any pictures of my tree piping, as there was a bit of mayhem happening in the background with my kids at the time. It's super easy though! Just melt some candy melts, put into a disposable piping bag (or a ziploc baggy with a hole cut in the corner), and draw little trees of varying sizes on parchment. They harden up in under 10 minutes. Carefully peel off of the parchment and stick to your cake with a little bit more melted chocolate, or additional buttercream. In my case my buttercream was a thick enough layer that I could just press them in. That's a great idea for a hostess gift! Looks like it turned out great!! !